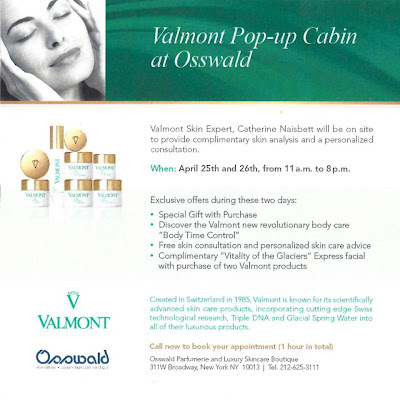 I just experienced an amazing facial this afternoon at the Valmont Pop-Up Spa Cabin at Osswald Parfumerie & Luxury Skin Care Boutique at 311 West Broadway. You can still visit the pop-up through tomorrow, April 26th. Lookout for my full review of Valmont skincare and facial experience coming soon!